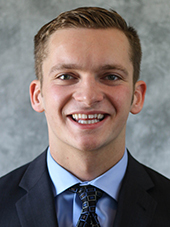 Wabash College student Joey Karczewski ’20 has earned a Benjamin A. Gilman International Scholarship to study abroad during the fall 2018 semester. The award will take him to Austria and Germany. Karczewski, an economics and German double major with a French minor who will study in Vienna, Austria, and Marburg, Germany, received the Gilman Scholarship, an award of $3,500, to apply towards study abroad or internship program costs. A member of the Wabash swim team, Karczewski posted four personal best times at the North Coast Athletic Conference Championships in February. Karczewski took an immersion trip to Tübingen, Germany, following his freshman year and studied abroad in India earlier this summer through funding by the G. Michael Dill Fund. These experiences have only cemented his belief in giving back as he prepares for a career in international business. Run by the Institute of International Education, the purpose of the program is to encourage participation in study abroad programs for under-represented students who are studying in under-represented areas of the world and/or under-represented languages. The IIE seeks scholars who are first-generation college students, students of color, and/or students of limited financial means. Scholarship recipients have the opportunity to gain a better understanding of other cultures, countries, languages, and economies -- making them better prepared to assume leadership roles within government and the private sector. Karczewski’s acceptance brings the number of Gilman Scholarship winners at Wabash during the 2017-18 academic year to three. Brandon Arbuckle ’19, who studied in Aberdeen, Scotland, and Joseph Bertaux ’19, who studied in Budapest, Hungary, both claimed Gilman awards to study abroad during the fall 2017 semester. Over the last five years, 34 Wabash men have earned international fellowships. The list includes a Rhodes Scholar, 16 Fulbright recipients, 10 Gilman Scholarship recipients, five USTA fellowship recipients, a TAPIF English Teaching Assistant (France), and a Cultural Ambassadors North American Language and Culture Assistantship in Spain.